If you plan on going after elk this year during Colorado's new fourth season which starts the second week of November, you might want to outfit yourself with this new Bison hunting boot from Danner. The Bison is Danner's newest Dri-Foot hunting boot for Fall 2000 and is designed to perform in a wide range of hunting applications. Whether you're tracking elk through snow and black timber or waiting on a tree stand in wet weather, the Bison will provide the fit and comfort expected from a Danner hunting boot. The Bison will be available in August 2000. The 8-inch Bison features cement construction and the Danner/Vibram LW Bob outsole for exceptional traction and cushioning. Constructed with 2.0-2.2mm waterproof, full-grain leather, the Bison features a Gore-Tex liner and 800-gram Thinsulate insulation for protection against cold, wet weather. It is crafted with a molded nylon insole and a removable triple-density EVA footbed, providing a stable footbed for extended periods of standing or walking. The 64-ounce Bison is available in men's sizes 7-14D and 6 1/2-13EE. Suggested retail price is $220. 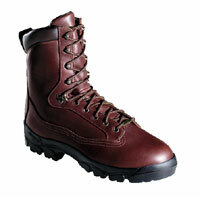 For a free catalog, call 1-800-345-0430 or visit the Danner web site at www.danner.com.